Your buffalo nickel value begins at 10 cents each for a heavily circulated, dateless coin. Common dates in full good or better condition are worth 60 to 70 cents each. Today's Buffalo nickel value listed just below, covers all dates, mint marks and major varieties. Discover a 1926-S in your collection and you have one of the "key" dates every collector needs. Minimum value $19. If your 1926-S buffalo nickel is in "Fine" or better condition dealers are paying $62 or more. This is only one example of a rare date, there are many more scattered throughout the series. Other than rare dates and varieties, what you are really hoping to find are better condition coins. An "Uncirculated" buffalo nickel has a minimum value of $17 to $22 and quickly rises into the hundreds. See "grading your coins" below, just after the buffalo nickel value table. The buffalo nickel value chart clearly shows the higher price dealers pay for higher condition coins. In some cases the difference is huge. If your buffalo nickels are closer to the next grade and value difference, definitely have it graded by an independent grading service. Today dealers and collectors are searching to find, and have the funds to buy well preserved coins. Your buffalo nickel value increases dramatically the better condition of your coin. What is a $6 coin in "Good" condition is suddenly a $100 coin in "Extremely Fine" condition. To assist in determining your buffalo nickel value, compare you coins to the images below and assign each a grade. The date is one of the first elements to show wear. A clear and distinct date separates a "Fine" condition coin from a lesser "Good" grade coin. If necessary use a magnifying glass. As you judge the reverse, the Buffalos' horn is clearly visible on better quality examples. Nice sharp, crisp detail on both the obverse and reverse is a highly collectible coin with increased buffalo nickel value. Do you have a couple of buffalo nickels in very nice condition and not sure of the correct grade? Check a few rare coin dealers' listings, look for those offering Buffalo Nickels for sale, their listings and prices usually include a notation of the NGC or PCGS assigned grade. Additionally... these coin dealers are potential buyers of your coins. By using a magnifying glass, look to magnify your buffalo nickel value. Certain small details on some coins greatly influence their value. Starting with the 1913 Type 1 and Type 2 reverses. Refer to the top image, the buffalo is standing on the Type 1 raised ground variety. This design was soon changed to the recess mound and continued for the rest of the series. 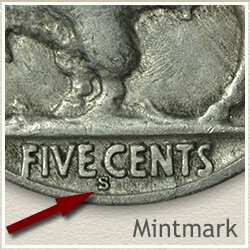 Next, look for mint marks, used to indicate the different mints that produce the coins, they have a large effect on your buffalo nickel value. Both the "S" for San Francisco and the "D" for the Denver mint are located on the reverse below the "FIVE CENTS". No mint mark was placed on coins from the Philadelphia mint. The 1918/7-D over date, look carefully at the 8 and see if the 7 is just visible. If so the value jumps to $370 for a coin in good condition. The 1937-D 3 legged buffalo. Yes, the mint polished away the front leg of the buffalo on one of the dies used to strike the coins. Now a very exciting and popular variety worth hundreds of dollars. Should you find one in your group, it is worth $258 or more in Fine condition. Visit rare coin dealers sites to quickly begin to understand the differences that make a buffalo nickel valuable. Compare your coins to those listed. Maybe you have the beginnings of a collection. One successful approach is to sell all your coins and use the proceeds to purchase one nice rare coin... the one you where hoping to find in the box. Pass the thrill of a rare and valuable coin on to your children. Buffalo Nickels are very popular. Older collectors who started by finding them in pocket change still enjoy and add to their collections. The price of the lower grade coins makes it easy for younger collectors to start. They are attractive in their design and price, giving them a value boost. Return and keep pace with your rising buffalo nickel value. The index page for the Shield, Liberty, Buffalo, Jefferson and Three Cent Nickels. Discover the value of your old nickels by matching your coins to the grading images and value charts. Visit the in-depth Buffalo nickel grading video, combined with enlarged images and detailed descriptions describing the differences between grades. Dates and mintmarks are only part of old nickel value. Follow the steps to grading Buffalo nickels and it leads to how much your coins are worth… accurately. Coin collecting is, to this day, a popular hobby. Your coins have the potential to add to a collection. Many Buffalo nickel enthusiasts are searching for coins in all conditions from good to mint state as they pursue their hobby. Compare your coins to those listed. Maybe you have the beginnings of a collection. One successful approach is to sell all your coins and use the proceeds to purchase one nice rare coin... the one you where hoping to find in the box. Pass the thrill of a rare and valuable coin on to your children. Additionally... Print the Coin Values Worksheet - link is in the navigation column - to list your coins and record their values. Should you decide to sell... use the worksheet as an invoice and packing slip when sending coins through the mail to dealers. It indicates you have done your coin values homework.